Slots glossary has a lot of useful terms concerning slots gambling and is traditionally designed to help the laymen learn maximum new about slots. Slots glossary is a real aid for the freshmen and inexperienced gamers. Don’t forget to look through Immortal Romance Slot Review! On the list of the slots glossary there are some most widely used terms that must be recognized by the gamers who want to succeed at slots. • Action: is known to be the particular bankroll the gamer wagers in certain moment. • Bonus feature: is considered to be the game that is offered in addition and adds to the overall return or offers extra spins. • Carousel: is known to be the range of slots at casino that are grouped together. • Change man: is the casino attendant that changes coins. • Comps: are the special remunerations for the loyal gamers and regular customers. • Coin size: is considered to be the minimum coin amount that slots have to take. • Drop box: is the special container for the extra coin collection from the hopper. • Edge: is the house advantage. It is the difference between the casinos odds and the odds of the gamer. • Hit: it is the slang variant of the winning term. • Hopper: is known to be the special slots area for the coin separation. • Maximum bet: is specific cash amount that are to be spent in order to gain bonuses or hit the jackpot. • One armed bandit: is the vintage name of the slot machine. • Pay line: is the line that shows the winning combination on the reels. • Payout: the earnings of the gamers. • Payout percentage: is the amount that is put in to the slots in relation to the amount percent of what is gained back. • Pay schedule: is the table of the symbols that are winning and that will repay. • Progressive pot: is the ultimate winning that is accumulated by means of each played coin. • Random number generator: Is the specific program that is used to control the payouts. • Rain on Roof: is the term to describe the sound of coins dropping from the slots when the jackpot is won. 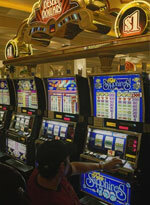 • Reels: is the slots wheel that has symbols that determine the winning combination. • Token: is the disc made of the metal that is used instead of the coins. • Wild symbol: is the slot machine symbol that can substitute any other to complete the winning combination. • Win rate: is the frequency of slot machine payouts.